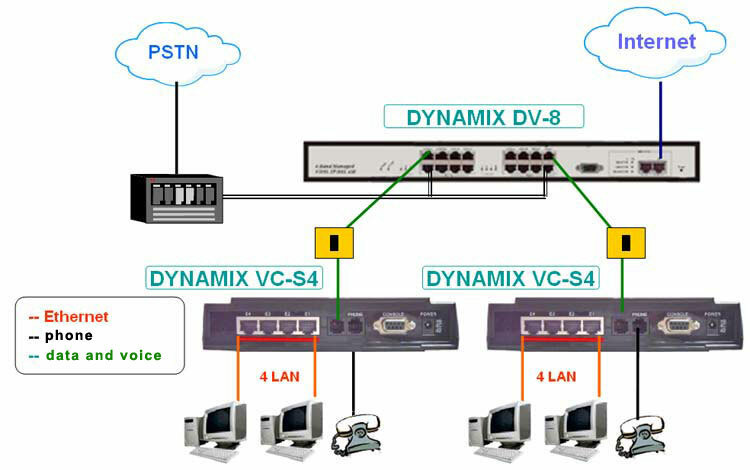 The DYNAMIX VC - S4 utilizes Ethernet to /from VDSL subscriber-site conversion bridge. The DYNAMIX VC - S4 uses QAM-based 4-band VDSL technology which supports high bandwidth up to 25Mbps symmetrical data service. The DYNAMIX VC - S4 also works with Dynamix DV-8 / Dynamix DV-24 VDSL IP DSLAM, together to form a cost-effective solution for services such as remote lecturing, telemedicine, video conferencing, Video-on-Demand (VoD), IP-TV, Internet access and various high-speed data applications. The front-panel provides LEDs indication of system and interface status. The built-in POTS/ISDN splitter allows a standard POTS phone or ISDN device to be connected. Full or half-duplex mode of LAN operations is automatically sensed and configured. VDSL link rates are configured by local IP DSLAMs over a fix-speed and an auto-speed function. Therefore, DYNAMIX VC - S4 supports fix-speed, auto-speed, plug & play operations on the subscriber-site, and are part of an ideal solution for delivering cost-effective, high-performance broadband/multimedia services to Multi-Dwelling Units (MDU) and Multi-Tenant Units (MTU) environments such as hotels, campus, hospitals and telecom.